I've been challenging myself to see how far I can stretch the dollar and still create healthy and nutritious meals. It's all too easy to succumb to the temptation of processed meals. Nevertheless there's always a price to pay for the convenience - the high salt content, additives and preservatives to ensure that the food stay "fresh" for unusually long period, plastic packaging which leak dangerous chemicals into our food. Is there any wonder why we're suffering from hypertension, cancer, ADHD and various other illnesses more than ever before? The total doesn't include the carcass as I often make chicken soup or stock. For argument sake, let's add a £1 to that so realistically, I'd probably have to fork out £9.12 for the entire chicken if I buy the parts separately. All you need is a sharp knife, a chopping board and a little know-how. Here's a video for those who haven't done this before. I do it a little differently as I like to leave the carcass whole. Like many of you, much as I enjoy cooking, I prefer quick and easy meals. I actually managed to get 4 meals out of a chicken. This is based on a family of 2 adults and 1 child. Since my hubby eats enough for 2, I'd say this easily applies to a family of 4 (2 adults, 2 children). Now if you have teenage boys, you may have to get a MUCH bigger chicken. So that's £4.80 divided by 4 meals = £1.20 per meal. The cost of potatoes, bread, thyme, carrots etc is negligible. Drizzle lemon juice all over the chicken portions. Rub salt and freshly ground pepper. Toss in some fresh thyme, tons of garlic and plenty of extra virgin olive oil and roast for an hour or so. I've only used one chicken breast for this meal. Slice horizontally to get thin slices (just like schnitzel). 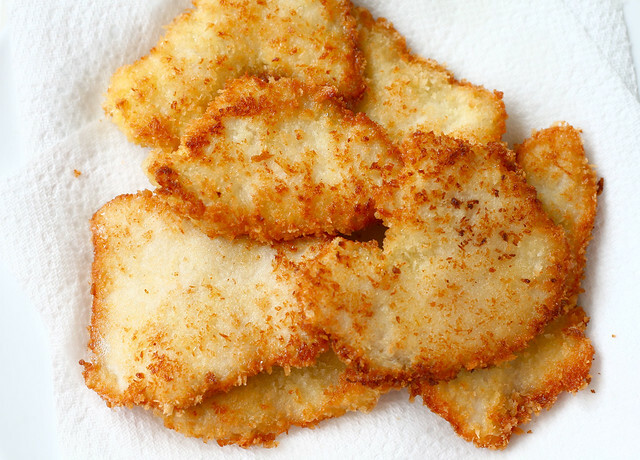 Dip in flour, egg and lastly panko breadcrumbs (sprinkled with garlic salt if you prefer). Drizzle plenty of oil onto a non stick pan. Fry for 3-5 minutes on each side on low-medium heat. I dumped the entire chicken carcass into a pot of water to make chicken stock. Since I'm making chinese style broth, I tossed in some ginger, carrots and just let it simmer for an hour or so. Store the stock in fridge or freezer for use at a later date. There was still tons of meat left on the carcass after I've made the stock so I carefully removed those. Mix the meat with French Mayo, a pinch of salt and a squeeze of lemon (optional) to make sandwich filling. This was enough for Lil L and hubby's lunch. There are nights when you're just totally exhausted and can't be bothered to cook. This is the perfect time to use the chicken stock. 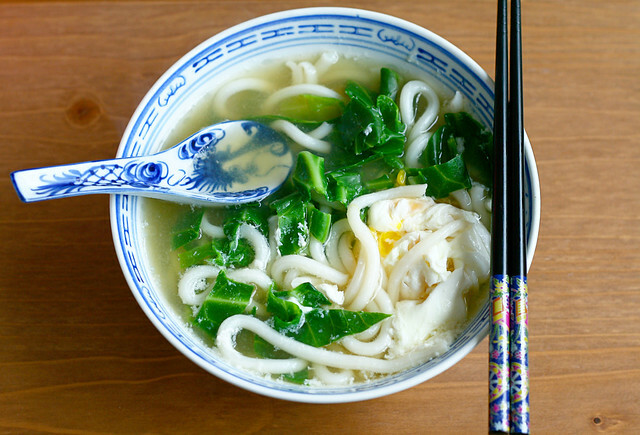 Instead of downing packets of ramen, make this instead. Put the stock into the pot, add a couple dashes of soy sauce, cut up some green, toss in udon and eggs. You could dump in fish balls or whatever that takes your fancy. Katsu is my favourite! I must try to stretch my chicken further! We make food stretch like this as well, though I haven't tried these recipes, I've bookmarked them :) Thanks so much for sharing! omg too amazing....everything looks to die for. I think my fav dish would be the first one! I'd just updated my blog and switched over to catch up on everyone else's blogs and there you are with one on chicken! I've just done the same! Have to say yours looks better than mine - drat! Mine is kind of basic. Even your chicken sandwich looks so yum. I'm such a heathen - I normally stick a couple of crisps in mine (harks back to the old office days). Domi, thank you for taking the time to write. I'm so pleased you like the blog. I'm no different. I've caught myself tossing out quite a lot of food from the fridge. LOL! I'm not sure if I'd dare to create 3 meals out of a green cabbage. That might just kill my carnivorous hubby. Wow, what a detailed post! I agree with you, I too like to buy whole chicken. My husband and kids hates whole chicken, They like boneless while I like cooking with, it is more flavorsome, IMHO. So I buy some breast only for them and 1 whole chicken for me and my maid. We used the bone for soups and meaty pieces for other dish to eat with rice. Great post, brilliant! I have always tempted to an idea of buying a whole chicken but i hate dealing with unpleasant messes so here goes $$$$$ down the drain. Your ideas are really great. I have been doing similar things by yielding a package of meat to make two meal and add more grains/beans instead of more meat. 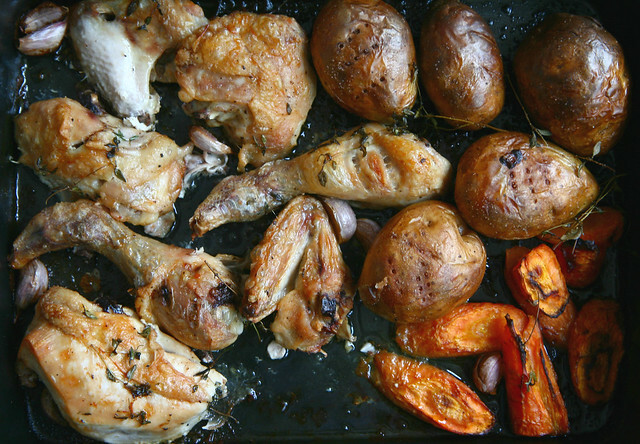 Will have to try your roasted chicken recipe, sounds so simple to make. It's pretty amazing how a whole chicken can become 4 meals like that. I would do that but I'm not too skilled with cutting it up. I'm quite fortunate to live right by my local Chinatown where the produce is fresh and cheap and I can visit the butcher at my convenience. oh gosh... THAT looks SOOOO Good, I"M DROOLING!!!!! ahhhh!!!!! You are my hero. Every one of these looks amazing!!! These all look delicious! I want to try the chicken katsu, yum! These all look so good. I am terrible at buying processed stuff. My 3 year old lives on mac and cheese. (We are working on his diet though...). The kid is SO picky and has been since he was born. Fortunately my 8 month old seems to have a healthy appetite. He is loving food and I can tell won't be a picky eater! M, you need to open a restaurant! LOL These dishes look SO GOOD! Not only are they prepared superbly, but also presented in such a manner. You kill me! I can't cut up a chicken worth a damn, but I do understand the economics of it. I've definitely been cooking more. Hope all is well with you. I absolutely love this post! You're creativity is so inspiring, and I love how you show that food can be versatile. Each and every one of these meals looks delicious, and even better that they don't take that long to make! Awesome! Hey, I'm always wondering what to do with chicken leftovers. Now I know how to use it differently , looks yummy ! 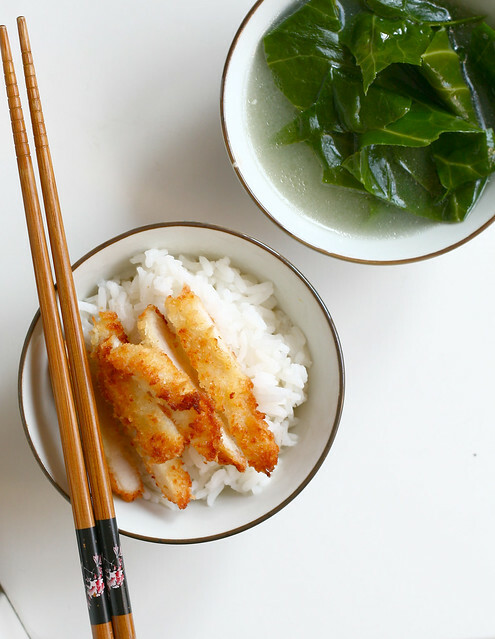 This has just inspired me to try chicken katsu at home. Yours looks so nice and light! i'm so going to try this this week!!! 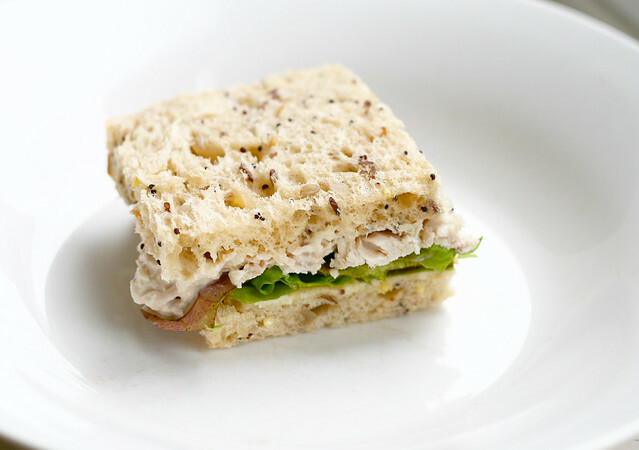 your chicken salad sammie looks YUM!! Great ideas! I definitely need to cook at home more. You are such an all-rounded person! Your husband and daughter are truly blessed. I love the recipes that you have shared. The roast chicken looks delicious and healthy. I think I can do something like this with rosemary too. Excellent post! I already do all of that except for the chicken katsu - didn't know it was so simple - thanks for sharing! Great post and photos! I want to try the chicken katsu! Anna, I've just sent you an email! Chat soon! I am absolutely horrible not only at planning meals ahead of time, but also at eating at home. We tend to eat out a LOT, mainly on weekends though. But it all really adds up. And I too usually avoid buying the whole chicken (to make sure there is as less prep time as possible before cooking), but after reading your post I might just start to change things up a little. Mona, I can't thank you enough for the encouraging words. It's readers like yourself that continue to motivate me to blog. You've included two of my top two faces, roast chickypoo and soup! I always put the lemon on too, makes it so delish! Yummmmmy, thanks for the tips, I love Katzu chicken, must try and make it. Looks delicious! This post is definitely what I needed being a student and all. Thanks! i love all the creative and healthy and delicious meals you've created with just 1 chicken. You are too clever! For the roast chicken..you just drizzle lemon juice and rub salt? No need to marinade before hand? I'd like to try out this one. I'm the ultimate lazy cook :) No marinating required. I just use plenty of herbs (thyme or rosemary), extra virgin oil and garlic. A chic sandwich for me please! Chicken katsu and chicken ramen? Can I please come live at your house?